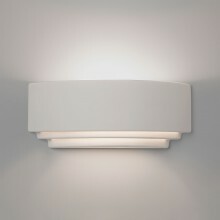 If you're looking to bring a softer lighting source into the home then these Amalfi wall lights are the ideal fitting. Created by Astro Lighting, the white ceramic finish can be painted to a colour that suits your taste and style. All Astro Amalfi collection lighting is available with free UK delivery.